Here are some great tricks to help with weight loss! 1. 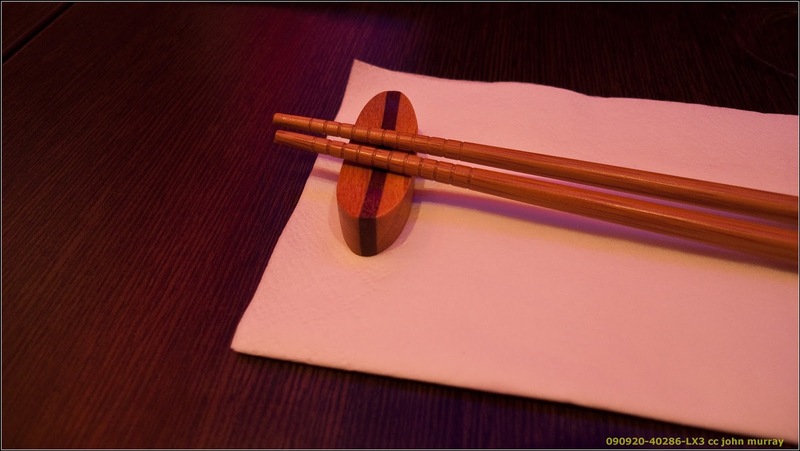 Use chopsticks while eating. You can get a nice pair and carry them with you when you go out. These will slow you down while eating allowing your body to register the food so that you will eat less and feel full sooner there by cutting your portions. 2. Use a salad plate instead of a regular sized dinner plate at home always! 3. Don't go back for seconds, or at least wait 15 minutes. Give your LEPTIN a chance! 4. Don't eat out. Ok this is unrealistic, right? Just ask the waiter to work with you. Order your dressing on the side. Steer clear of loaded potatoes, frys, and oily rice. Some types of fat are ok, but seriously unless a restaurant boasts about using olive oil, coconut oil, or some other healthy fat in their dishes, then they probably use what's in the budget. 5. Plan your meals ahead of time. No plans can lead to "fast high carb/bad fat food." Not good. 6. Keep healthy snacks prepared in the fridge so if you are starving you won't grab junk. Some suggestions would be any raw veggie you like. Have some bone broth or any clear soup you can heat up. A small portion of healthy raw nuts( about 16-17 nuts is portion). Read the label on the nuts! Nuts are rich and high in fat and calories. It is good fat but remember, calories in, calories out. 7. Throw out all processed food from your pantry meaning anything with more than 3 ingredients. Don't be tempted to buy more. Keeping them around for the kids is not an excuse, they don't need it either! 8. No white foods meaning white rice, white potatoes, white bread, white flour. Ok so I splurge on sushi occasionally!! It's my weakness..
9. No carbs after 2-3 in the afternoon, including fruit. 10. Be a label reader, if it has more than 3 ingredients, stay away. 11. Stay away from alcohol. Alcohol cheats your metabolism because it needs to be processed first there by sending your food to be stored in your thighs, stomach, or wherever you keep your fat. Not to mention a buzz causes us to make bad food decisions. I know this may be a sacrifice for some but If you can do it while you are actively trying to lose weight it will really help. So, maybe set a goal for 6 weeks. 12. Eliminate all dairy while you are trying to lose weight. Exceptions would be full-fat yogurt with fruit instead of dessert. The best is dairy is from a farm that does not process their milk and farms organic and free range. You may need to do some research to find these. 13. Eat a high protein/fat breakfast to help your body feel satiated and help your hormone balance. This actually works! 14. Eat organic, grass fed, free range, wild caught proteins. 15. Eat often, about every 3-4 hours. The Ketogenic Gurus will tell you different but unless you are trying to go into ketosis and you are eating almost all fats and almost no carbs(less than around 25 grams per day) you need to eat small balanced portions (300 calories) more frequently in order to "stoke the metabolic fire." 16. Exercise. If you have a lot to lose, just walk, work your way up to more and always check with your Doctor before starting an exercise program. 17. Eliminate all processed foods from your diet. Be a whole food foodie! 18. Read books about nutrition. Watch videos about nutrition. There are some great video links on this blog from previous posts. Educating yourself can help you to internalize the information and will help the information stay in your subconscious which will affect the choices you make. 19. If you work at a desk job, eat a small healthy lunch and go for a walk or do some light exercise during your lunch hour. Try standing up more often if possible. Click here for more information. 20. If you have cravings, once a week take a day off and have whatever you want, just get back to your healthy habits the next day. Many people find that once they start getting results they don't want to "take a day off." Incorporate these things into your life and you will be amazed!